The adoption of twin column structure achieves energy saving, high rigidity, and faster acceleration/deceleration. 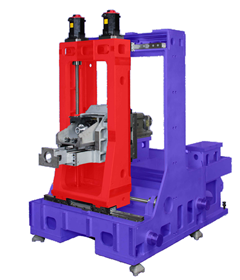 The Monolithic structure of a combined bed and the first column provides High Rigidity and adds a low center of gravity to the whole machine . The movable second column is constructed of ductile cast iron for weight reduction.